This is one of over fifty art installations we saw near Kulin on our way to Wave Rock. 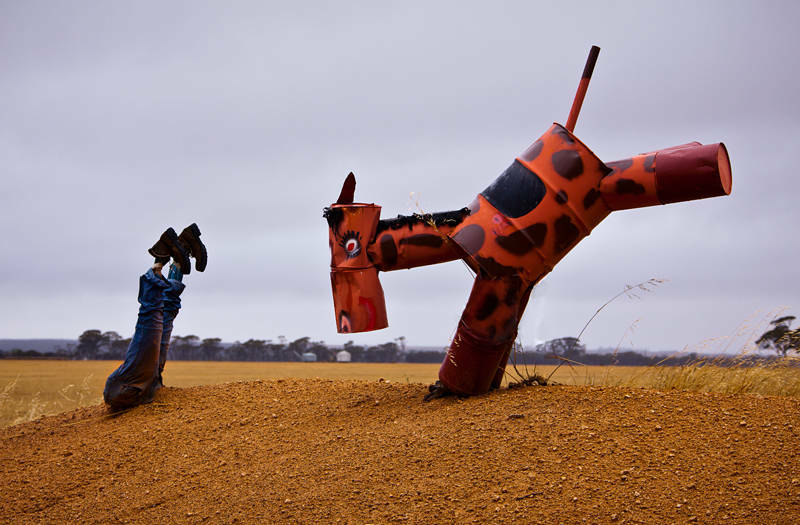 We took a slight detour to travel along the Tin Horse Highway but it was worth it to see the ingenious ways local farmers recycled old junk into these humorous sculptures. As you can see from the background it has not been all blue sky here. Western Australia has been experiencing an exceptionally wet year since we landed 7 weeks ago. Some areas have had a year’s worth of rain in a single day. We have seen a little flooding but nothing like the scale the eastern states experienced last year. I am told the sandy nature of the ground here ensures Western Australia can absorb a lot of water. We will be spending one more night on the road before arriving in Hopetoun which will be our base till the end of January.